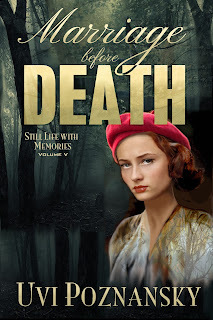 Marriage Before Death is the fifth installment in the Still Life with Romance series featuring Lenny and Natasha Kaminsky. Once again the story begins in the present time. Lenny is the loving caretaker to his wife, Natasha, who is suffering from the ravages of Alzheimer's Disease. Her memory is slowly fading about their unusual courtship during World War Two, especially, about the events that took place during and after D-Day, the invasion of Normandy, France. In this installment, Lenny is a member of the U.S. Marines attached to an army unit that lands in France during that fateful day. He is separated from his unit and is eventually captured out of uniform by the Germans. They intend to execute him as a spy. To his surprise and consternation, Natasha enters the picture as a member of the French resistance. It is only later he learns that she had volunteered to work with them. Although it is obvious that Lenny avoids the hangman's noose, to say more as to how he got away would spoil the story. What the reader sees is how their relationship survives the horrors of war making their love for one another all the stronger. Through their eyes we see the terrible sights, sounds and smells of war, something no one ever forgets. This is Uvi Poznansky at her masterful best. Five stars! This book was sent to me for an unbiased review.